It was another before sunrise 'wake and drive' day which concluded my time in Arkansas - a one stop, had a great time, met some cool people but have to go west day. I don't dislike Arkansas but lurking in the back of my mind were persistent thoughts of pristine mountain ranges and if I find a hike or mountain bike trail along the way - all the better. I wasn't sure where I would end up for the day but somewhere west of Arkansas before rerouting north towards Kansas for a loosely planned stop in Fort Riley, KS to visit my warrior son, Logan. That was it - not much more - just flow. I headed west and it wasn't long before I left Arkansas and entered Oklahoma. Driving, thinking, dreaming and and on the lookout for anything new. One thousand thoughts flowed through my mind. I thought about where I have been and where I am going. I absorbed what I saw and in Oklahoma, its about the tribal nation, green flowing plains and blue skies. Did you know there are 67 tribal nations in Oklahoma? If you are interested, this site has a listing of them all. It starts to make sense why the state's name is derived from the Choctaw words okla and humma, meaning "red people". But I was on the lookout for places to explore that get me out of the driver's seat. The number of miles I drove was enough to make anyone restless and although car-exploring has its place, I usually want to break it up and ideally settle somewhere for while to burn off a few calories. At some point along the way I decided enough was enough. I need to get off this highway and research where to go because I wasn't finding anything along the drive - a visitors center would suffice. I stopped - I learned and made my way to a few parks I had found. The first park on the hit list was Red Rock Canyon State Park. 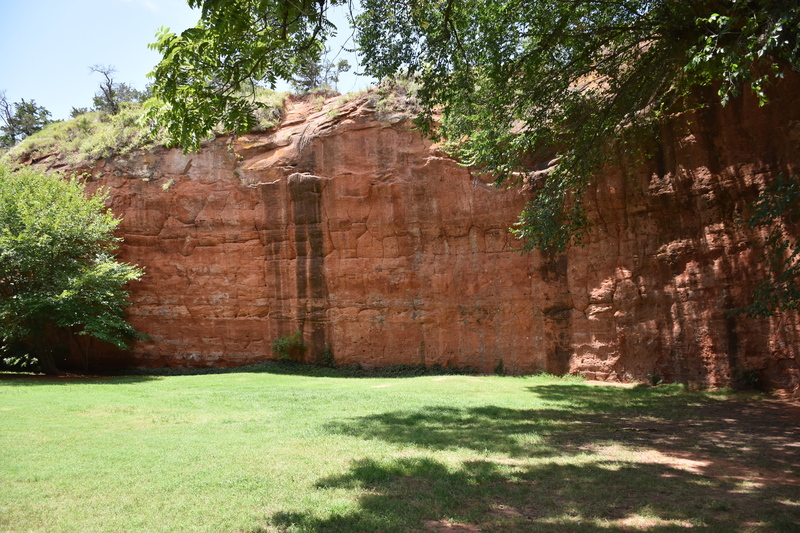 It is a nice little park with numerous rappelling sites, interesting red rock cliffs and campsites tucked neatly next to canyon walls. I found this park a nice contrast to the low flowing plains of Oklahoma and stopped to take a few photos and video the interesting landscape. Eventually I had to decide whether to stay here or drive north to another park. The decision is simple - It is 100+ degrees, nowhere to swim/kayak. I decided to hit the road again, but here are a few photos from the visit. Red Rock Cliffs - Notice the rappelling marks on the cliff edges? More Red Rocks - A really beautiful place. 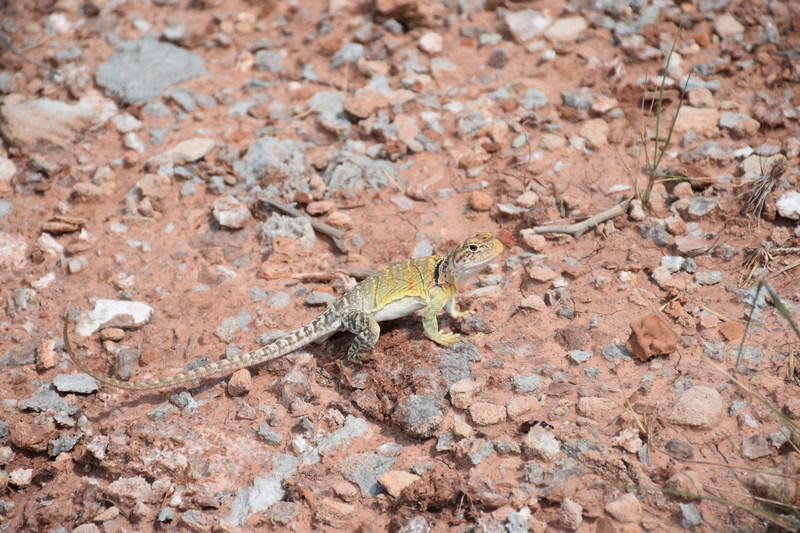 A small collared lizard? Not really sure but if anything it is a baby since adult collared lizard length is 8 to 14 inches. This guy was about 6 inches long. 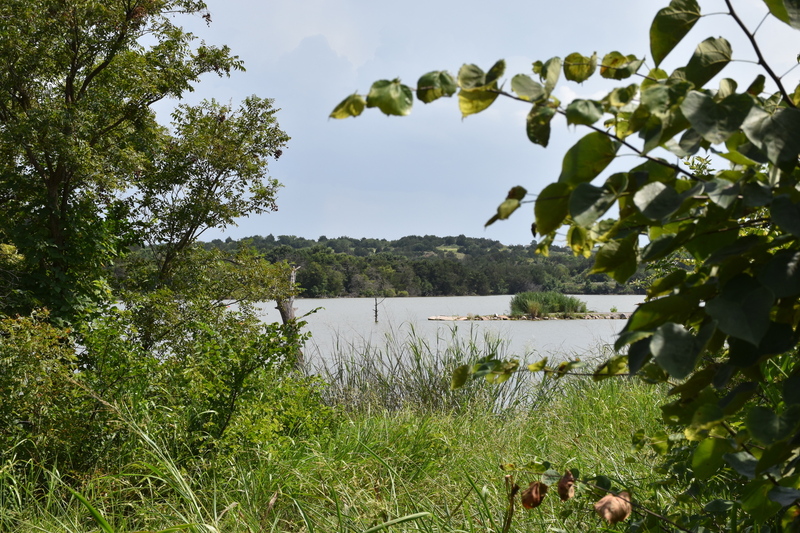 Roman Nose State Park was next on the list. It does have lakes and that would provide a means to cool off - or so I thought. When I got there I set up my tent and began a hike through the canyon to climb a mesa or two. The Lake Loop trail is a seven mile loop with several mesa access trails. I chose the first access trail which will get you to the closest mesa climb. The climb was steep but not very difficult although I did struggle a bit near the top because I hadn't prepared to scramble much. Once I climbed to the top I was treated to spectacular views that the loop trail couldn't provide. Isn't that why we climb things in first place? I continued hiking the mesa 'peak' a bit until I found a descent location to climb down. This lead back to the main loop and hiked it out until I bumped into campgrounds. Although the hike/climb is difficult, take plenty of water during summer because you will need it. 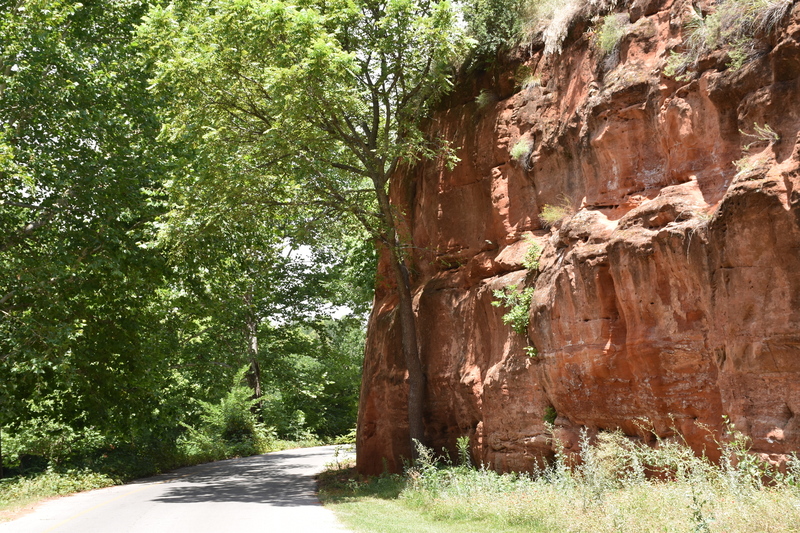 It is brutal climbing in Oklahoma heat. I was suffering and experienced the heat induced nausea that I have dealt with before. After a water re-supply and a brief discussion with a park ranger, I found out swimming isn't allowed. I was thinking 'WTF'. Hey at least I got a hike out of it but now I have to decide to stay or go. It is getting camp setup time but once again - I packed my tent and left for a hotel or something. 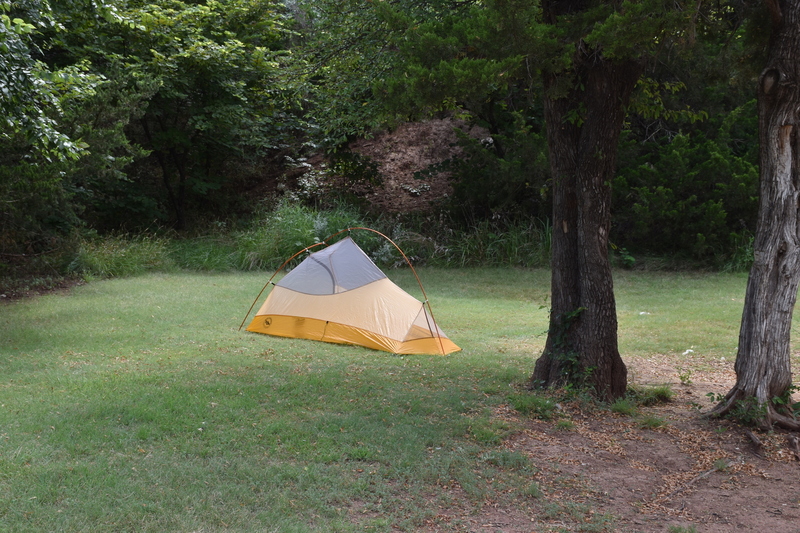 A sparse camp spot. Do you need more than a tent in 103+ degrees? 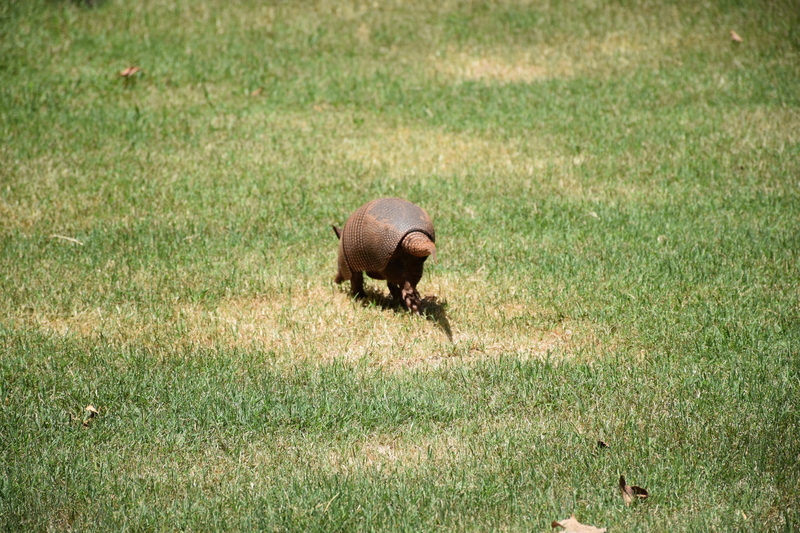 This little armadillo was scurrying off to somewhere with his personal heat absorbing shell and a tail pointing my exit. 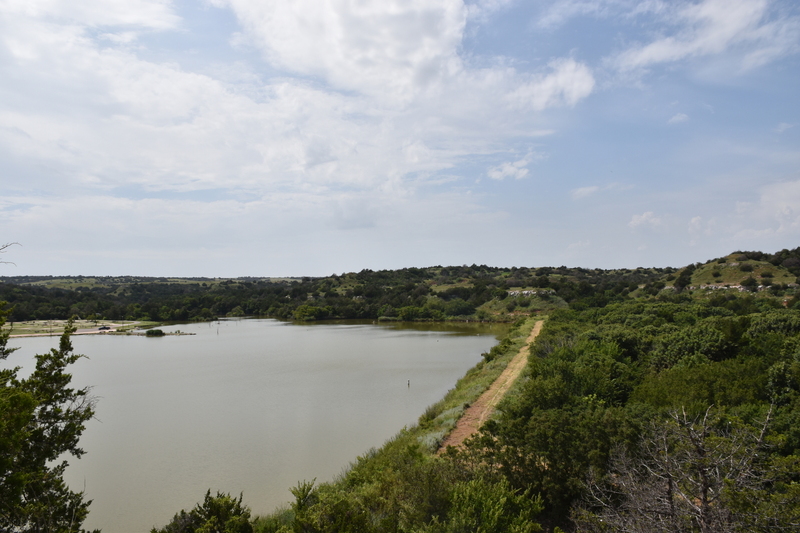 Roman Nose State Park - The beginning of a nice hike. 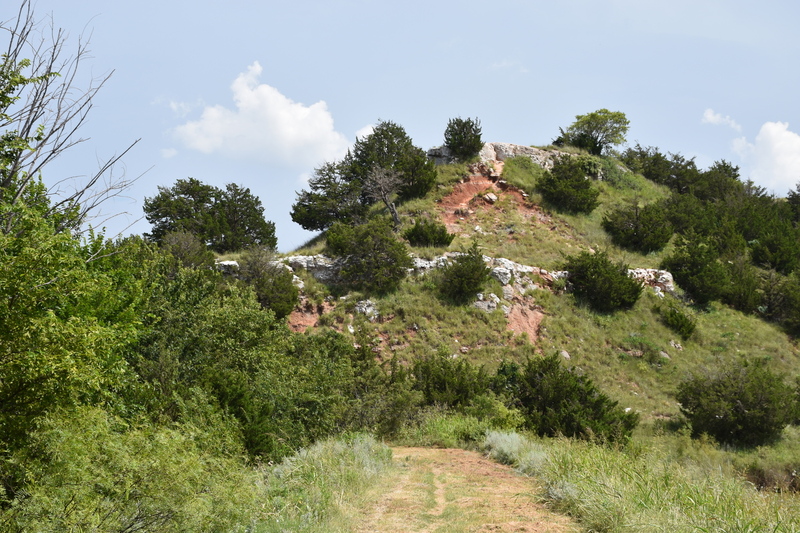 Roman Nose State Park - Start of the climb - It might not look step but it is - esp. with camera gear and lots of water. 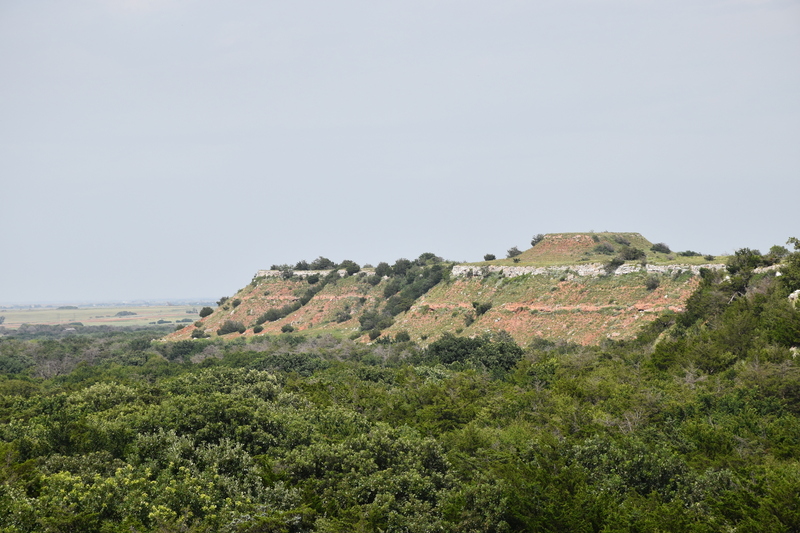 Roman Nose State Park - A view from the top of a hill. Roman Nose State Park - Another top of a mesa view. I find a hotel - small town, barely sufficient hotel called the Watonga Hotel but it served its purpose and was cheap. After a quick shower and beer, I gained my energy back and went 'out on the small town'. I found a tiny dive bar - the only type of bar here - and made that my chill spot before calling it a day. As I sat there thinking about it all, I have to acknowledge that it wasn't the most exciting day. It is only a day in a process and on days where I spent many hours driving, I am exploring, seeing new places and just doing more than I would on a given day in normal life. I appreciate it for what it is and look forward to tomorrow's adventures.